^ mercurial. Merriam-Webster Online. [2008-06-12]. ^ Hermian. Wiktionary. 2010-08-02 [2013-11-02]. ^ 3.00 3.01 3.02 3.03 3.04 3.05 3.06 3.07 3.08 3.09 3.10 3.11 Mercury Fact Sheet. NASA Goddard Space Flight Center. 2007-11-30 [2008-05-28]. ^ Yeomans, Donald K. HORIZONS System. NASA JPL. 2008-04-07 [2008-04-07]. ^ 7.0 7.1 P. Kenneth Seidelmann, B. A. Archinal, M. F. A’hearn, A. Conrad, G. J. Consolmagno, D. Hestroffer, J. L. Hilton, G. A. Krasinsky, G. Neumann, J. Oberst, P. Stooke, E. F. Tedesco, D. J. Tholen, P. C. Thomas, I. P. Williams. Report of the IAU/IAG Working Group on cartographic coordinates and rotational elements: 2006. Celestial Mechanics and Dynamical Astronomy. 2007-07-01, 98 (3): 155–180 [2018-04-02]. ISSN 0923-2958. doi:10.1007/s10569-007-9072-y （英语）. ^ 9.0 9.1 Mallama, A.; Wang, D.; Howard, R.A. Photometry of Mercury from SOHO/LASCO and Earth. Icarus. 2002, 155 (2): 253–264. Bibcode:2002Icar..155..253M. doi:10.1006/icar.2001.6723. ^ 10.0 10.1 Vasavada, Ashwin R.; Paige, David A.; Wood, Stephen E. Near-Surface Temperatures on Mercury and the Moon and the Stability of Polar Ice Deposits (PDF). Icarus. 1999-02-19, 141 (2): 179–193. Bibcode:1999Icar..141..179V. doi:10.1006/icar.1999.6175. Figure 3 with the "TWO model"; Figure 5 for pole. ^ 11.0 11.1 11.2 Mallama, A. Planetary magnitudes. Sky and Telescope. 2011, 121(1): 51–56. ^ 12.0 12.1 Espenak, Fred. Twelve Year Planetary Ephemeris: 1995–2006. NASA Reference Publication 1349. NASA. 1996-07-25 [2008-05-23]. ^ Wudka, Jose. Precession of the perihelion of Mercury. Physics 7: Relativity and Cosmology. Department of Physics & Astronomy, University of California, Riverside. 1998-09-24 [2010-08-09]. （原始内容存档于2011-08-13）. ^ 15.0 15.1 NASA photos reveal Mercury is shrinking - Yahoo! News 互联网档案馆的存檔，存档日期2008-02-08. ^ Mercury magnetic field. C. T. Russell & J. G. Luhmann. [2007-03-16]. ^ Staff. Mercury. US Geological Survey. 2003-05-08 [2006-11-26]. ^ Lyttleton, R. A. On the Internal Structures of Mercury and Venus. Astrophysics and Space Science. 1969, 5 (1): 18. Bibcode:1969Ap&SS...5...18L. doi:10.1007/BF00653933. ^ Gold, Lauren. Mercury has molten core, Cornell researcher shows. Chronicle Online (Cornell University). 2007-05-03 [2008-05-12]. ^ 21.0 21.1 Finley, Dave. Mercury's Core Molten, Radar Study Shows. National Radio Astronomy Observatory. 2007-05-03 [2008-05-12]. ^ Spohn, Tilman; Sohl, Frank; Wieczerkowski, Karin; Conzelmann, Vera. The interior structure of Mercury: what we know, what we expect from BepiColombo. Planetary and Space Science. 2001, 49 (14–15): 1561–1570. Bibcode:2001P&SS...49.1561S. doi:10.1016/S0032-0633(01)00093-9. ^ Gallant, R. 1986. The National Geographic Picture Atlas of Our Universe. National Geographic Society, 2nd edition. ^ 26.0 26.1 26.2 26.3 Benz, W.; Slattery, W. L.; Cameron, A. G. W. Collisional stripping of Mercury's mantle. Icarus. 1988, 74 (3): 516–528. Bibcode:1988Icar...74..516B. doi:10.1016/0019-1035(88)90118-2. ^ 27.0 27.1 Cameron, A. G. W. The partial volatilization of Mercury. Icarus. 1985, 64 (2): 285–294. Bibcode:1985Icar...64..285C. doi:10.1016/0019-1035(85)90091-0. ^ Weidenschilling, S. J. Iron/silicate fractionation and the origin of Mercury. Icarus. 1987, 35 (1): 99–111. Bibcode:1978Icar...35...99W. doi:10.1016/0019-1035(78)90064-7. ^ 29.0 29.1 Grayzeck, Ed. MESSENGER Web Site. Johns Hopkins University. [2008-04-07]. ^ BepiColombo. ESA Science & Technology. European Space Agency. [2008-04-07]. ^ Messenger shines light on Mercury's formation. Chemestry World. [2012-05-01]. ^ Staff. Scientists see Mercury in a new light. Science Daily. 2008-02-28 [2008-04-07]. ^ Categories for Naming Features on Planets and Satellites. US Geological Survey. [2011-08-20]. ^ Blue, Jennifer. Gazetteer of Planetary Nomenclature. US Geological Survey. 2008-04-11 [2008-04-11]. ^ 35.0 35.1 Dunne, J. A.; Burgess, E. Chapter Seven. The Voyage of Mariner 10 – Mission to Venus and Mercury. NASA History Office. 1978 [2008-05-28]. ^ Strom, Robert. Mercury: a post-Mariner assessment. Space Science Reviews. 1979, 24: 3–70. Bibcode:1979SSRv...24....3S. doi:10.1007/BF00221842. ^ Staff. Mercury. U.S. Geological Survey. 2003-08-05 [2008-04-07]. ^ Morris, Jefferson. Laser Altimetry. Aviation Week & Space Technology. 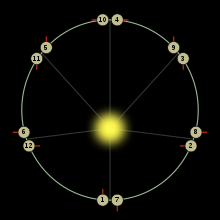 2008-11-10, 169 (18): 18. Mercury's crust is more analogous to a marbled cake than a layered cake. ^ 41.0 41.1 41.2 41.3 41.4 41.5 41.6 Spudis, P. D. The Geological History of Mercury. Workshop on Mercury: Space Environment, Surface, and Interior, Chicago. 2001: 100. Bibcode:2001mses.conf..100S. ^ Shiga, David. Bizarre spider scar found on Mercury's surface. NewScientist.com news service. 2008-01-30. ^ Schultz, Peter H.; Gault, Donald E. Seismic effects from major basin formations on the moon and Mercury. Earth, Moon, and Planets. 1975, 12 (2): 159–175. Bibcode:1975Moon...12..159S. doi:10.1007/BF00577875. ^ Wieczorek, Mark A.; Zuber, Maria T. A Serenitatis origin for the Imbrian grooves and South Pole-Aitken thorium anomaly. Journal of Geophysical Research. 2001, 106 (E11): 27853–27864 [2008-05-12]. Bibcode:2001JGR...10627853W. doi:10.1029/2000JE001384. （原始内容存档于2011-05-12）. ^ 46.0 46.1 46.2 Wagner, R. J.; Wolf, U.; Ivanov, B. A.; Neukum, G. Application of an Updated Impact Cratering Chronology Model to Mercury' s Time-Stratigraphic System. Workshop on Mercury: Space Environment, Surface, and Interior. Proceedings of a workshop held at The Field Museum.. Chicago, IL: Lunar and Planetary Science Institute: 106. October 4–5, 2001. Bibcode:2001mses.conf..106W. ^ Dzurisin, D. The tectonic and volcanic history of Mercury as inferred from studies of scarps, ridges, troughs, and other lineaments. Journal of Geophysical Research. 1978-10-10, 83 (B10): 4883–4906. Bibcode:1978JGR....83.4883D. doi:10.1029/JB083iB10p04883. ^ Van Hoolst, Tim; Jacobs, Carla. Mercury's tides and interior structure. Journal of Geophysical Research. 2003, 108 (E11): 7. Bibcode:2003JGRE..108.5121V. doi:10.1029/2003JE002126. ^ 49.0 49.1 McKee, Maggie. Ice Confirmed on Mercury Despite Planet's Solar Proximity. 科學人. 2012-11-29. ^ Prockter, Louise. Ice in the Solar System (PDF). Volume 26. Johns Hopkins APL Technical Digest. 2005 [2009-07-27]. （原始内容 (PDF)存档于2006-09-11）. ^ Lewis, John S. Physics and Chemistry of the Solar System 2nd. Academic Press. 2004: 463. ISBN 0-12-446744-X. ^ Murdock, T. L.; Ney, E. P. Mercury: The Dark-Side Temperature. Science. 1970, 170 (3957): 535–537. Bibcode:1970Sci...170..535M. PMID 17799708. doi:10.1126/science.170.3957.535. ^ Lewis, John S. Physics and Chemistry of the Solar System. Academic Press. 2004: 461 [2008-06-03]. ISBN 978-0-12-446744-6. ^ Ingersoll, Andrew P.; Svitek, Tomas; Murray, Bruce C. Stability of polar frosts in spherical bowl-shaped craters on the moon, Mercury, and Mars. Icarus. 1992, 100 (1): 40–47. Bibcode:1992Icar..100...40I. doi:10.1016/0019-1035(92)90016-Z. ^ Slade, M. A.; Butler, B. J.; Muhleman, D. O. Mercury radar imaging – Evidence for polar ice. Science. 1992, 258 (5082): 635–640. Bibcode:1992Sci...258..635S. PMID 17748898. doi:10.1126/science.258.5082.635. ^ Williams, David R. Ice on Mercury. NASA Goddard Space Flight Center. 2005-06-02 [2008-05-23]. ^ 57.0 57.1 57.2 Rawlins, K; Moses, J. I.; Zahnle, K.J. Exogenic Sources of Water for Mercury's Polar Ice. Bulletin of the American Astronomical Society. 1995, 27: 1117. Bibcode:1995DPS....27.2112R. ^ Harmon, J. K.; Perillat, P. J.; Slade, M. A. High-Resolution Radar Imaging of Mercury's North Pole. Icarus. 2001, 149 (1): 1–15. Bibcode:2001Icar..149....1H. doi:10.1006/icar.2000.6544. ^ Domingue, Deborah L.; Koehn, Patrick L.; 等. Mercury's Atmosphere: A Surface-Bounded Exosphere. Space Science Reviews. 2009, 131 (1–4): 161–186. Bibcode:2007SSRv..131..161D. doi:10.1007/s11214-007-9260-9. ^ Hunten, D. M.; Shemansky, D. E.; Morgan, T. H. The Mercury atmosphere (PDF). Mercury. University of Arizona Press. 1988 [2009-05-18]. ISBN 0-8165-1085-7. ^ Lakdawalla, Emily. 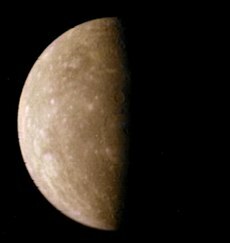 MESSENGER Scientists 'Astonished' to Find Water in Mercury's Thin Atmosphere. 2008-07-03 [2009-05-18]. （原始内容存档于2008年7月7日）. ^ Zurbuchen, Thomas H.; Raines, Jim M.; 等. MESSENGER Observations of the Composition of Mercury's Ionized Exosphere and Plasma Environment. Science. 2008, 321 (5885): 90–92. Bibcode:2008Sci...321...90Z. PMID 18599777. doi:10.1126/science.1159314. ^ Instrument Shows What Planet Mercury Is Made Of. University of Michigan. 2008-06-30 [2009-05-18]. ^ Killen, Rosemary; Cremonese, Gabrielle; 等. Processes that Promote and Deplete the Exosphere of Mercury. Space Science Reviews. 2007, 132 (2–4): 433–509. Bibcode:2007SSRv..132..433K. doi:10.1007/s11214-007-9232-0. ^ McClintock, William E.; Vervack Jr., Ronald J.; 等. MESSENGER Observations of Mercury's Exosphere: Detection of Magnesium and Distribution of Constituents. Science. 2009, 324 (5927): 610–613. Bibcode:2009Sci...324..610M. PMID 19407195. doi:10.1126/science.1172525. ^ Seeds, Michael A. Astronomy: The Solar System and Beyond 4th. Brooks Cole. 2004. ISBN 0-534-42111-3. ^ Williams, David R. Planetary Fact Sheets. NASA National Space Science Data Center. 2005-01-06 [2006-08-10]. ^ 69.0 69.1 69.2 Staff. 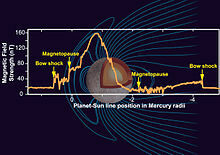 Mercury’s Internal Magnetic Field. NASA. 2008-01-30 [2008-04-07]. （原始内容存档于2013年3月31日）. ^ Gold, Lauren. Mercury has molten core, Cornell researcher shows. Cornell University. 2007-05-03 [2008-04-07]. ^ Christensen, Ulrich R. A deep dynamo generating Mercury's magnetic field. Nature. 2006, 444 (7122): 1056–1058. Bibcode:2006Natur.444.1056C. PMID 17183319. doi:10.1038/nature05342. ^ 73.0 73.1 Steigerwald, Bill. Magnetic Tornadoes Could Liberate Mercury's Tenuous Atmosphere. NASA Goddard Space Flight Center. 2009-06-02 [2009-07-18]. ^ Space Topics: Compare the Planets: Mercury, Venus, Earth, The Moon, and Mars. Planetary Society. [2007-04-12]. （原始内容存档于2006-09-02）. ^ Espenak, Fred. Transits of Mercury. NASA/Goddard Space Flight Center. 2005-04-21 [2008-05-20]. ^ Biswas, Sukumar. Cosmic Perspectives in Space Physics. Astrophysics and Space Science Library. Springer. 2000: 176. ISBN 0-7923-5813-9. ^ Laskar, J. Chaotic diffusion in the Solar System. Icarus. 2008-03-18, 196 (1): 1–15. Bibcode:2008Icar..196....1L. doi:10.1016/j.icarus.2008.02.017. ^ Laskar, J.; Gastineau, M. Existence of collisional trajectories of Mercury, Mars and Venus with the Earth. Nature. 2009-06-11, 459 (7248): 817–819. Bibcode:2009Natur.459..817L. PMID 19516336. doi:10.1038/nature08096. ^ Clemence, G. M. The Relativity Effect in Planetary Motions. Reviews of Modern Physics. 1947, 19 (4): 361–364. Bibcode:1947RvMP...19..361C. doi:10.1103/RevModPhys.19.361. ^ Gilvarry, J. J. Relativity Precession of the Asteroid Icarus. Physical Review. 1953, 89 (5): 1046. Bibcode:1953PhRv...89.1046G. doi:10.1103/PhysRev.89.1046. ^ Anonymous. 6.2 Anomalous Precession. Reflections on Relativity. MathPages. [2008-05-22]. ^ USGS Astrogeology: Rotation and pole position for the Sun and planets (IAU WGCCRE). [2009-10-22]. ^ Tezel, Tunç. Total Solar Eclipse of 2006 March 29. Department of Physics at Fizik Bolumu in Turkey. 2003-01-22 [2008-05-24]. ^ Dunne, J. A.; Burgess, E. Chapter One. The Voyage of Mariner 10 – Mission to Venus and Mercury. NASA History Office. 1978. ^ Dunne, J. A. and Burgess, E. Chapter Four. The Voyage of Mariner 10 – Mission to Venus and Mercury. NASA History Office. 1978 [2008-05-28]. ^ Phillips, Tony. NASA 2006 Transit of Mercury. SP-423 Atlas of Mercury. NASA. October 1976 [2008-04-07]. ^ BepiColumbo – Background Science. European Space Agency. [2008-05-30]. ^ Tariq Malik. MESSENGER to test theory of shrinking Mercury. USA Today. 2004-08-16 [2008-05-23]. ^ Ness, Norman F. Mercury – Magnetic field and interior. Space Science Reviews. 1978, 21 (5): 527–553. Bibcode:1978SSRv...21..527N. doi:10.1007/BF00240907. ^ Dunne, J. A. and Burgess, E. Chapter Eight. The Voyage of Mariner 10 – Mission to Venus and Mercury. NASA History Office. 1978. ^ Grayzeck, Ed. Mariner 10. NSSDC Master Catalog. NASA. 2008-04-02 [2008-04-07]. ^ MESSENGER Engine Burn Puts Spacecraft on Track for Venus. SpaceRef.com. 2005 [2006-03-02]. ^ 101.0 101.1 Countdown to MESSENGER's Closest Approach with Mercury. Johns Hopkins University Applied Physics Laboratory. 2008-01-14 [2008-05-30]. （原始内容存档于2013年5月13日）. 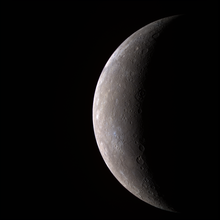 ^ MESSENGER Gains Critical Gravity Assist for Mercury Orbital Observations. MESSENGER Mission News. 2009-09-30 [2009-09-30]. （原始内容存档于2013年5月10日）. ^ "NASA extends spacecraft's Mercury mission". UPI, 15 November 2011. Retrieved 2011-11-16. ^ 104.0 104.1 ESA gives go-ahead to build BepiColombo. European Space Agency. 2007-02-26 [2008-05-29]. ^ Fleming, Nic. Star Trek-style ion engine to fuel Mercury craft. The Telegraph. 2008-01-18 [2008-05-23]. ^ Objectives. European Space Agency. 2006-02-21 [2008-05-29]. ^ Beck, Roger. A Brief History of Ancient Astrology. Wiley-Blackwell. 2007: 84–87. ISBN 1-4051-1074-0. Geody Mercury World’s search engine that supports NASA World Wind, Celestia, and other applications. Planets — Mercury A kid’s guide to Mercury.